Loose lips blow up Death Stars, Selkie. Welp, I read her expression sorta right. And she looks real disappointed in Selkie too. XD Can’t say I blame her. It’s weird seeing Tehk brag about her abilities like this. I think humans finding out about this is good in the long term, and the sooner the better. Though this was def one of the worst ways it could have happened. Not sure if I agree. I get that getting people used to this sooner than later is better in the long term, but in the short term, humans can be…well, racist. What’s that quote? Some people can’t tolerate other people with a 30% melanin difference. Then there are some who won’t tolerate others with a different faith. Now they have to deal with green people with sharp claws and teeth; I’m not sure the are quite ready to find out that some can shoot lasers from their eyes. But by not revealing it all they are adding “government conspiracy” and “you lied to us” on top of it all. Much like many of the other things- ‘revealing’ it to kids is better than showing adults- ’cause Kids’ll just be like “Oh, cool, magic powers! Makes perfect sense!” because it doesn’t mess with their worldview at all. Show a bunch of physicists… you might end up with mass panic, suicides, or at the very least something of a ‘how does it work’ witchhunt. And having the kids find out first has another benefit. If the adults find out first, and have to tell their kids, they’ll bring with them all their worry, confusion, fear, etc in their instructions and reactions to their kids- essentially teaching that it is ‘wrong’ or ‘bad’ or ‘frightening’. But if the kids know first, then the parents find out, and the parents freak out, but the kids are all “Yeah, so? What’s wrong with that?”- that blase question might be just what’s needed to get the parents to realize how not-a-big-deal some stuff is. Not sure I agree with either part of this. Even free-floating rumors of the powers of an Echo are bound to add new energy to every paranoid conspiracy theory anyone has ever dreamed up. And, sadly, humans being humans, some people are bound to react by fearing and hating all Sarnothi. But it IS going to come out eventually. It’s too big. It can’t be kept secret forever. Is this really one of the worst ways? A wild rumor rattling around among the kids in a primary school? Perhaps I am too cynical about human nature, but I’m afraid I can think of a rather large number of worse ones. Professor Trunchbull, for instance, if he wanted to, could make things much worse for all Sarnothi. Mind you, this development does uniquely have the potential to make things pretty rough for Selkie, so if that’s what you meant, I agree! Oh. Yes. Well, I think we are agreed that there were plenty of better ways to handle getting the news out there. This development is slow-release. Most adults would discount it. “Pssh, imagine that, kids do say the darndest things!” If the government agency is on the ball, they do still have enough time to implement one of the good ways. But, my prediction is, they won’t — because where’s the story in that, hmm? And Selkie may have a point, did we see her being told to keep this a secret or was it just heavilly implied she should? Either way it would be up to the adults – but even they are just partialy to blame because realistically the only way to avoid this would have been to lock Selkie up and that’s another can of worms. can´t remember the exact page, but she was definitely told to keep it top secret, just like she wasn´t supposed to talk about the colony, though the later has become a bit of a moot point with sarnothis being ‘out of the closet’ so to speak. Defines “know”. Hhmmm, Kinda like defining “is”. Isn’t there some sort of Greek philosophy branch, … Epistemology? … Ontology? Somethings likes that? Ontology is the knower knowing the knower? And epistemology is the knower knowing the objuect known? Gah! I should remember this stuff!! Modern kids don’t have 80s cartoons openly feeding morality lessons by breaking the fourth wall at the end of each episode. How else can Selkie learn that knowing is half the battle GI Joeeeeee? Well, My Little Pony does that, and so does…um…huh. I think that’s it. Probably why I actually like that show. Huh. THAT’S WHAT SUE AND KATHRYN IS MISSING! I couldn’t quite put my finger on it, but that’s what it was! Maybe have a few “commercial break” one page strips that could be a tribute to 80s cartoons AND 80s comic book ads! Only you can prevent forest fires and stop villains with hostess fruit pies at the same time! One of my favorite spoofs on the subject is in F is for Family. A commercial airs with a dinosaur fighting off heavily stereotypical Mexicans, which are fruit and vegetables, and asks his sidekick, a bowl, to pour him an immense volume of chocolate cereal to give him the energy to fight them off. Could also be a poke in the ribs to “Veggie Tales” which uses Peas as Roman Centurions, a tomato and a cuke as partners in crime, er,… Virtue! The problem is that you can easily slide into Very Special Episode/”Just say No” territory, where the message becomes so full of propaganda and hyperbole that it becomes unintentionally funny and people are more inclined to snark at it than listen to it. Glad she subtly is telling Selkie she should have known better to divulge sensitive information for the sake of bragging in order to spite someone else. I think Selkie learned her lesson. It’s better for her to learn this lesson with relatively few humans, most of whom are sympathetic to her, actually witnessing it. Although Tehk might have learned the wrong lesson from this. “Tease a Jin’Sorai about being a drama queen and she’ll react with maximum drama!” is something I could see him thinking. Dave, are my old eyes missing something obvious on the site…? Is there some way to do a tag search for a tag that’s not on the page we’re looking at? Because… that would be really, really handy to have. 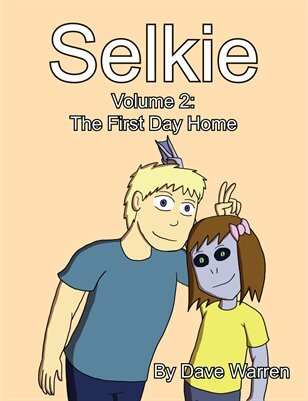 Just type it out manually, like https://selkiecomic.com/tag/tehk/ – just change tehk to whatever tag you want to find. I had a flashback to the Clinton/Lewinski days, which I think was intentional. Im just worried about Te Fahn, if she keeps worrying her hair like that, its gonna break off in her hands/claws/paws/hooves/mitts/other.